Last Friday marked the release of Hundred Booster Pack Vol. 4: Mikado Evolution! This will be the final Booster Pack release for the Future Card Buddyfight Hundred series, but fret not! A new season of Future Card Buddyfight, Triple D, is rolling out very soon! Find out more at the special feature here! So, have you gotten your new cards yet? No?! Well, let us pique your interest by showing you some of the cool cards you can get from this booster! We’ll be showcasing cards featuring key characters in the anime – one from each world included in this Booster Pack! The last of the Great 8 is finally here! This monster doesn’t just look like a boss – Grangadez packs several keyword abilities that help you dictate the flow of battle. Grangadez has one simple ability that helps it do just that – when it enters the field, you get to put the top 3 cards of your deck into its soul. Naturally, it has [Soulguard] – with 3 cards in its soul right off the bat, Grangadez will be a pain to remove from the field indeed. 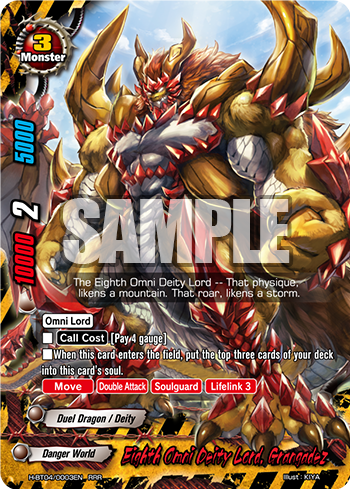 The Eighth Omni Deity Lord also has [Move], which complements Danger World’s playstyle well. On your turn, you can keep Grandgadez on the left or right slots so you can attack with an equipped Item, then [Move] it to the center to help block attacks on your opponent’s turn! Remember to defend it properly, though – Grangadez has [Lifelink 3], which can get you in a tricky situation if Grangadez leaves the field. Although it sacrifices some defensive stats, this card boasts a staggering 10000 attack – enough to break through the defenses of cards like “Jackknife “Gold Ritter”” and “Second Omni Demon Lord, Asmodai“! It also has [Double Attack] – perfect for going up against hardy opponents and dealing that extra bit of damage! Drum has attained transcendent power in this new form as a Super Dragon Lord! It has a mind-boggling 10000 attack and 3 critical, and although it doesn’t have the key offensive abilities [Double Attack] and [Penetrate], it more than makes up for it with its two powerful abilities. “Steadfast Bond” allows you to revive with 1 life when your life would become 0, as long as you are able to discard a card from Kaizer Drum’s soul. Your opponent has to remove Kaizer Drum from the field in order to bypass this ability (unless they have “Great Fate, Frozen Stars” or “Fairy King, Oberon” on the field), and since it comes with [Soulguard], that’s not going to be an easy feat. 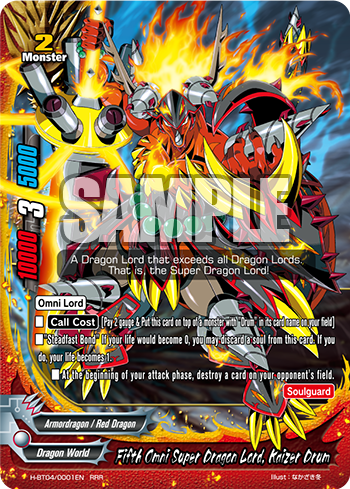 As if “Steadfast Bond” is not powerful enough, the Fifth Omni Super Dragon Lord also has the ability to destroy a card on the opponent’s field at the start of your attack phase!! This ability basically eliminates the need for [Penetrate] and allows you to go straight for the fighter! Gratos and the Knights of the Apocalypse feature new effects that become stronger when they are buddy monsters. Gratos’ own effect allows the player to put more cards into its soul to use as ammunition for its ability, if it is a buddy monster! 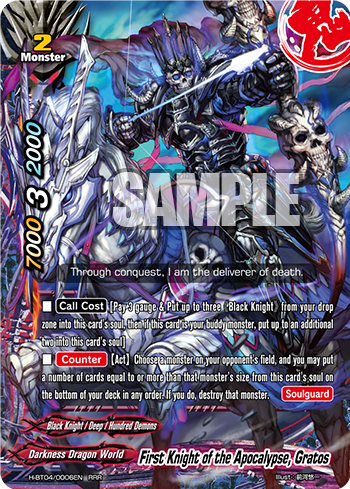 The First Knight of the Apocalypse can also put the cards in its soul back to the bottom of the deck to destroy a monster on the opponent’s field! 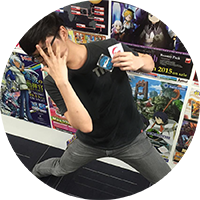 This is a [Counter] [Activated] ability, which means you can use it both offensively on your turn, and defensively on your opponent’s turn. The only problem with this effect is that you probably will only get 1-2 shots off if you’re going after larger Size monsters, reducing the effectiveness of its [Soulguard]. Gratos is no pushover in combat either; with 7000 attack, it can break through most Size 2 and below monsters’ defenses, and it has 3 critical. Coupled with its ability to destroy monsters, Gratos can easily help you pave a path to victory through the center. This latest incarnation of Yamigedo is possibly the most fiendish and powerful of them all. 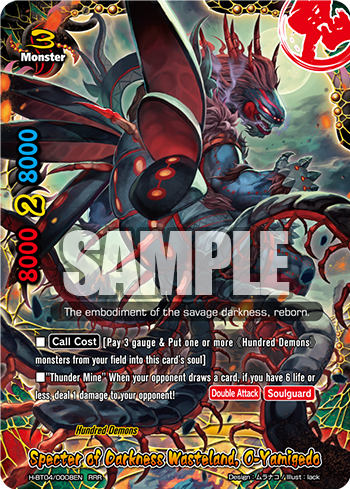 As part of its cost, you can put up to 3 Hundred Demons monsters into its soul to feed its [Soulguard] ability, and it has [Double Attack] to further improve its combat prowess. It possesses a sizable 8000 attack and defense and 2 critical, but what sets it apart is its vicious Thunder Mine ability. O-Yamigedo’s Thunder Mine ability deals damage to the opponent… when they draw cards! This not only counts drawing cards by effect… but also counts the player’s start-of-turn draw! And the most fearsome part is that this ability… activates multiple times per turn. That’s right, every time your opponent draws cards, they’ll take damage! A devastating ability that slowly whittles away the opponent’s health as they attempt to get back into the game – one misstep, and it’s game over. Jack isn’t going to be outdone by Yamigedo and Drum – he gains a new form this time too, and it’s every bit as awesome as it looks. 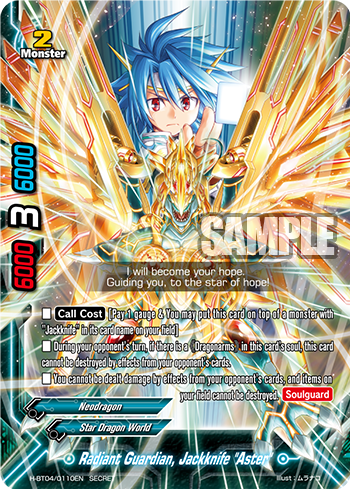 “Radiant Guardian, Jackknife “Aster”” has all the hallmarks of a Jackknife, with its potential to store large amounts of cards in the soul. This version of Jackknife also possesses a high base attack, defense and critical stats as well as the crucial [Soulguard] ability. We previously covered the various Jackknife forms, so do take a look at this article for more info! Jackknife “Aster”’s two abilities makes it a formidable opponent to deal with. While it can still be destroyed via battle, or removed from the field via movement effects like “Magical Goodbye“, its ability to ignore effect-based destruction renders it immune to the likes of “Dragonic Survive“, “Hundred Demons Sorcery, Do or Die” or “Death Grip“. This complements its [Soulguard] very well, as you don’t have to [Soulguard] against destruction effects. Its second ability prevents you from taking damage from abilities like Thunder Mine, or even Impact cards! As this card states that you cannot be dealt damage at all, even cards whose damage cannot be reduced, like “Gargantua Punisher! !“, cannot deal damage to you! All these awesome cards are making my hand itch – can’t wait to experiment and play with the new cards from Hundred Booster Pack Vol. 4: Mikado Evolution! I, for one, am really excited for Kaizer Drum! How about you?